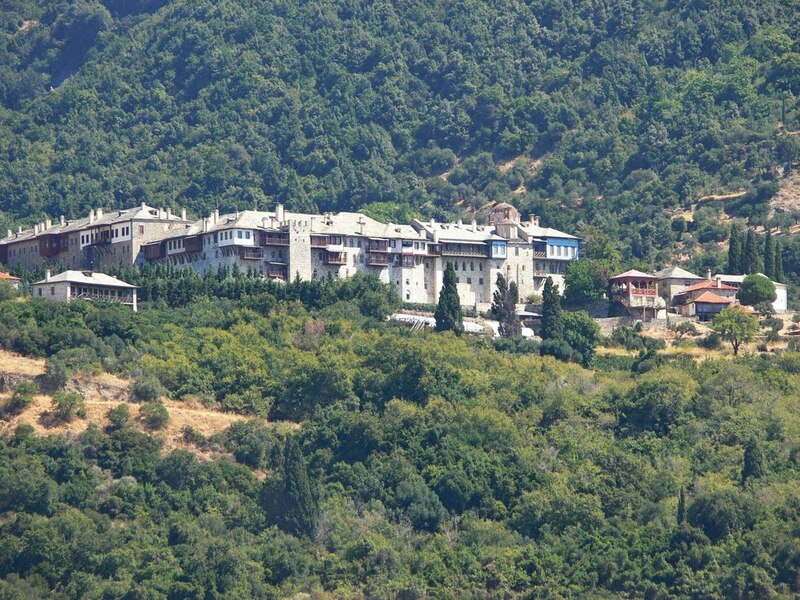 A blog page dedicated to the Holy Mountain - Mount Athos. 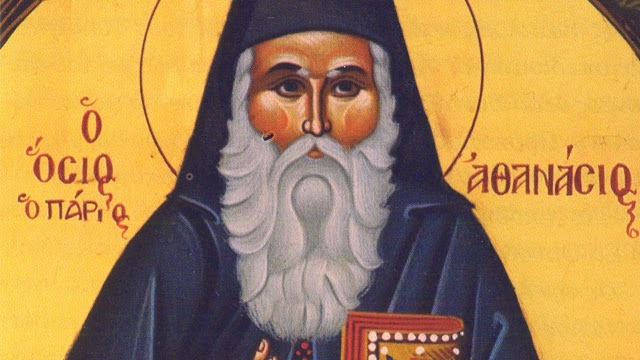 On the 24th of June we commemorated St. Athansios Parios a Saint with very close ties to Mount Athos and the Athonias Ecclesiastical Academy (Athoniada). Our venerable and God-bearing St. Athanasius Parios, known as "Master of the Greek Nation," was a hieromonk who was an eminent theologian, philosopher, educator, and hymnographer of the eighteenth century. He was the second leader of the Kollyvades movement, succeeding Neophytos Kausokalyvites (1713-1784). He also wrote the lives of a number of saints. 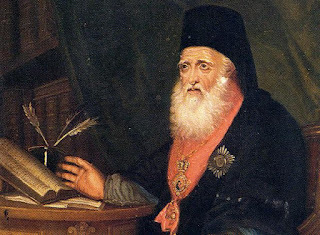 In 1752, he traveled to Mount Athos and enrolled in the Athonias Academy, where he studied under Neophytos Kausokalyvites and Eugenios Voulgaris. 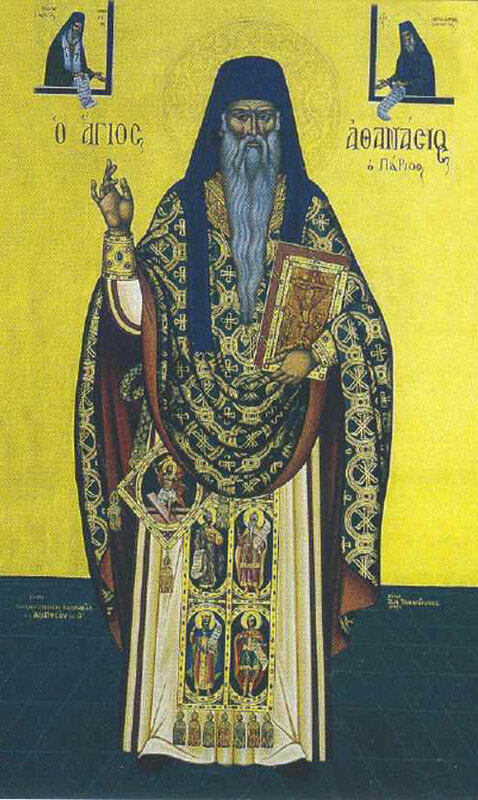 At Mount Athos, he was ordained a priest by St. Marcarius of Corinth. He later studied at Corfu under Nikephoros Theotokis. 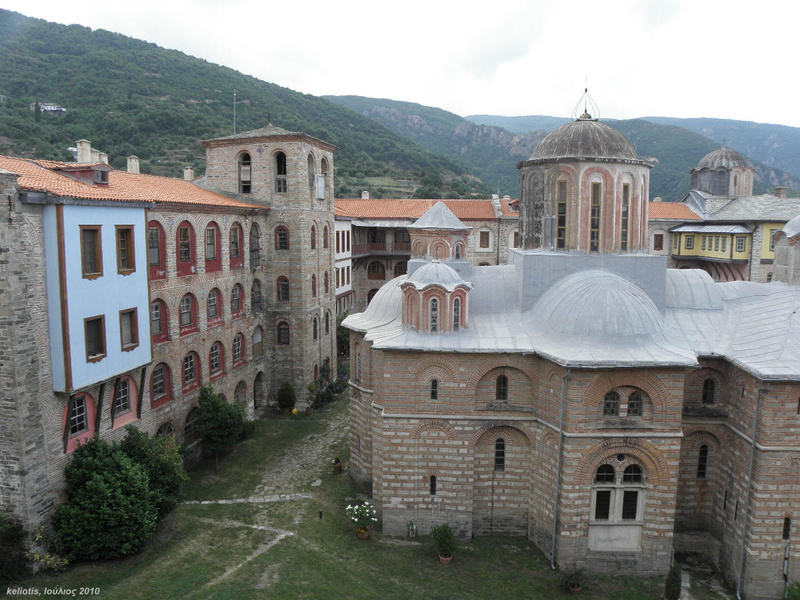 At Mount Athos, Fr. 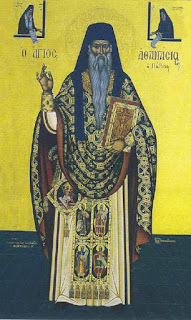 Athanasius became a leading member of the Kollyvades movement that began at Mount Athos in the mid eighteenth century. 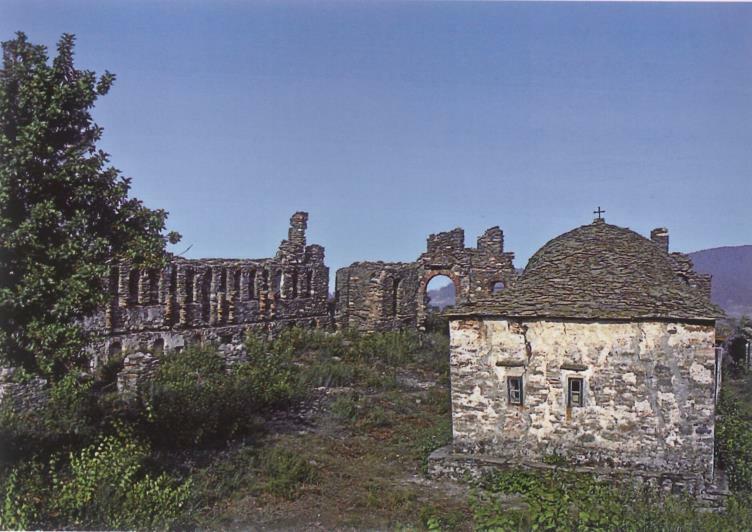 The group consisted of Athonite monks who adhered strictly to Holy Tradition and opposed unwarranted innovations. They favored frequent reception of Holy Communion, unceasing prayer of the heart, and insisted memorial services not be performed on Sundays, as it was the day of the Lord's Resurrection. Between 1767 and 1770, he taught at Thessaloniki, after which he returned to the Athonias Academy to become its director. As a member of the Kollyvades movement, he came under attacks by those who opposed the movement. In 1788, St. Athanasius moved to the island of Chios where he taught and served as director at the gymnasium until 1812. A leading educator and distinguished theologian, St. Athanasius revived the art of eloquent speech on Chios by teaching logic, rhetoric, metaphysics,and theology. After retiring, at the age of 90, as the Director of schools in 1812, St. Athanasius joined St. Nicephorus of Chios at the Hermitage of St. George the Refston at Resta, Chios where he spent his final days. There, he reposed in the Lord on June 24, 1813. 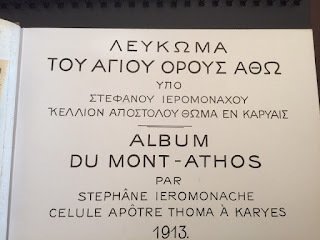 In continuation of my series of posts relating to a rare book on Mount Athos by Hieromonk Stephanos, Greek - ΛΕΥΚΩΜΑ ΤΟΥ ΑΓΙΟΥ ΟΡΟΥΣ ΑΘΩ, french - ALBUM DU MONT - ATHOS, we will explore the author and his biography. 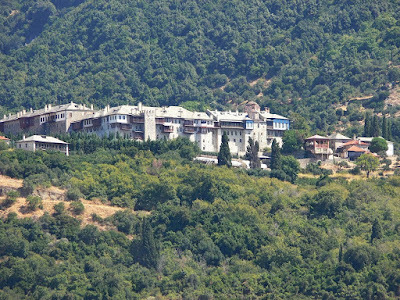 The Hieromonk Stephanos, worldly name Stergios Lampropoulos, was from the village Rodovistsa in the province of Tsotiliou in the state of Kozani. He was born in 1885 and was tonsured a monk in 1903 at the Cell of St. Thomas of Fr Serapheim in Karies, Mount Athos. In 1906 - 1907 he founded, along with Panagiotis Stournaras, the Photographic workshop "Athos", and eventually maintained on his own after 1912. The workshop was located in the yard of the Cell. He was also the official photographer of the Holy Epistasia (Governing Body), of Mount Athos. 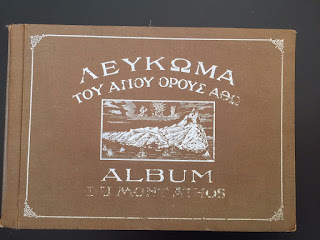 He publicised the well renowned and above pictured book, containing a series of pictures of Mount Athos (1913-1928) and a series of post cards. A close co-worker of his was the Hieromonk Vasilios. 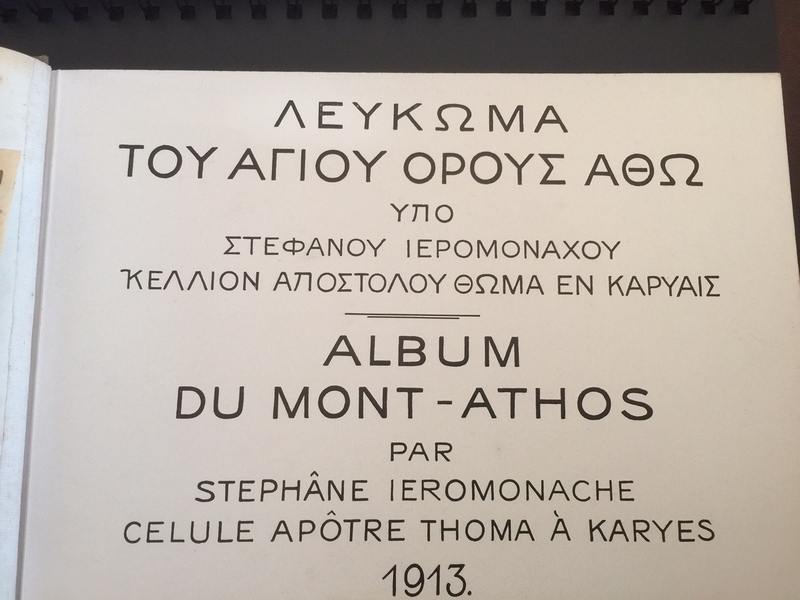 In 1928 the above-mentioned book was published in Magdemburg with its famous and impressive photos of Monasteries, Sketes, Towers, Boat houses, Phiales and other treasures of Mount Athos. The book also contains a photo of his cell of which only the church remains to this day. 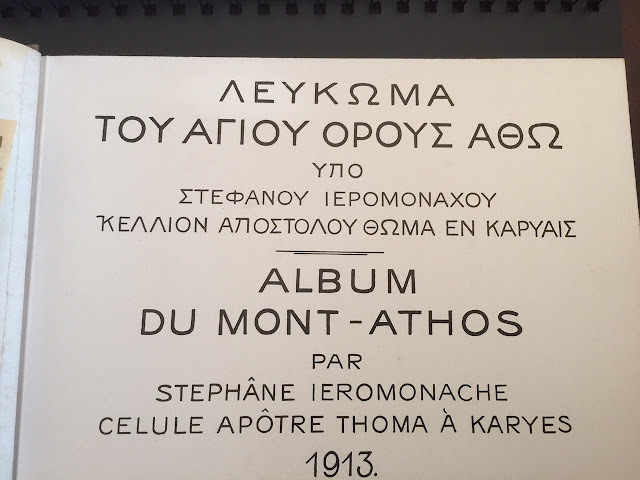 The book was republished in 1986 by the publishing house Malliari, along with three photographs from the book/album Griechenland (Berlin 1928) of Hanns Holdt and Hugo Von Hofmannstahal, titled Athos within old photographs, with text and descriptions written by writer Dimitris Bambakas. And a special thanks to "Keliotis" or Giannis Konstiotis for guiding me in the right direction. 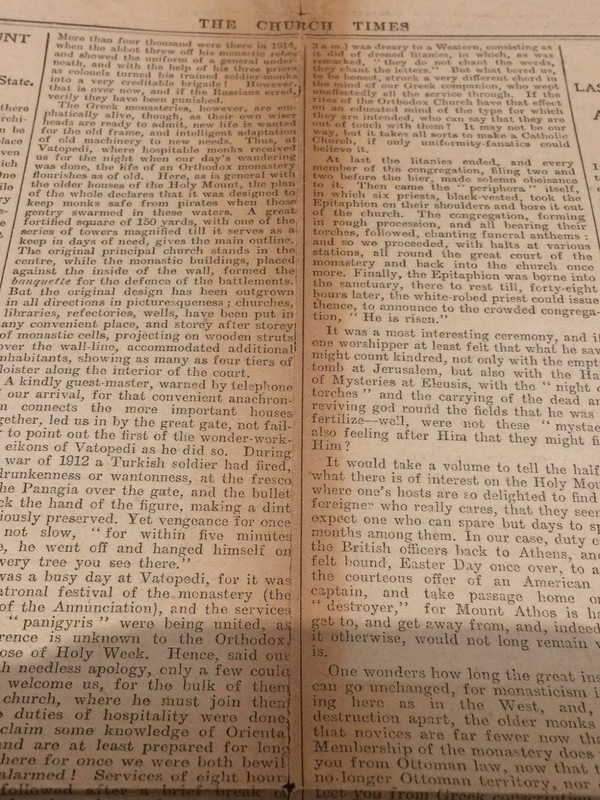 In Part 3 I will continue re-writing from the newspaper article from the Church Times dated April 17, 1924 and titled HOLY WEEK ON MOUNT ATHOS. More than a thousand were there in 1914, when the abbot threw off his monastic robes and showed the uniform of a general underneath, and with the help of his three priors as colonels turned his soldier-monks into a very creditable brigade! However, that is over now, and if the Russians erred, verily they have been punished. The Greek monasteries, however, are emphatically alive, though, as their own wiser heads are ready to admit, new life is wanted for the old frame, and intelligent adaptation old machinery to new needs. Thus, at Vatopedi, where hospitable monks received us for the night when our day's wandering was done, the life of an Orthodox Monastery flourishes as of old. Here, as is general with the older houses of the Holy Mount, the plan of the whole declares that it was designed to keep monks safe from pirates when those gentry swarmed in these waters. A great fortified square of 150 yards, with one of the series of towers magnified till it serves as a keep in the days of need, gives the main outline. The original principle church stands in the centre, while the monastic buildings, placed against the inside of the wall, formed the banquette for the defences of the battlements. But the original design has been outgrown in all directions in picturesqueness; churches, libraries, refectories, wells, have been put in any convenient place, and storey after storey of monastic cells, projecting on wooden struts over the wall-line, accommodated additional inhabitants, showing as many as four tiers of cloister along the interior of the court. A kindly guest-master, warned by telephone of our arrival, for that convenient anachronism connects the more important houses together, led us in by the great gate, not failing to point out the first of the wonder-working ikons of Vatopedi as he did so. During the war of 1912, a Turkish soldier had fired, in drunkenness or wantonness, at a fresco of the Panagia over the gate, and the bullet struck the hand of the figure, making a dint religiously preserved. Yet vengeance for once was not slow, "for within five minutes Kyrie, he went off and hung himself on that tree you see there." 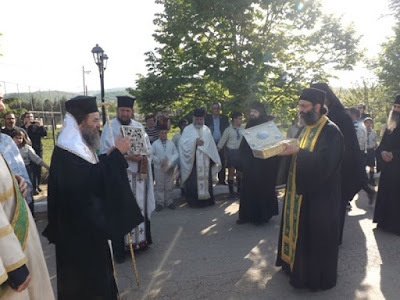 It was a very busy day at Vatopedi, for it was the patronal festival of the Monastery (the Feast of the Annunciation), and the services of the "panigyris" were being united, as transference is unknown to the Orthodox with those of Holy Week. Hence, said our host with needless apology, only a few could come to welcome us, for the bulk of them were in church, where he must join them, when the duties of hospitality were done. We may claim some knowledge of oriental services, and are at least prepared for long rites; but here for once we were both bewildered and alarmed! Service of eight hours in length, followed after a brief break of three hours by rites that endure nine hours more, tax even experienced patience, and when the officiant jumps perpetually, without warning, from rites of the Annunciation to those of Good Friday, even an expert may sometimes wonder where he is. With the help of a friendly Deacon and a missal, one could follow the rarely celebrated Liturgy of St. Basil from the post of privilege in the sanctuary, and the Liturgy done, examine the marvels of that treasure house. For a thousand years now pilgrims of any rank from Imperial downwards, have brought their offerings hither, and the result is a collection that a Roman Catholic member of the party thought superior to that in St. Peters in Rome! Here, too, are the relics of which the mass of gold and jewels are but the setting, large fragments of the true Cross (in one case festooned with emeralds as large as one's finger-nails), and the "Zone of the Virgin" that stays plague in the land. It is true that the main treasure of Vatopedi was at the moment not in the sanctuary, but in the nave, for special reverence on the festal day. This is the "Talking Eikon" of the Blessed Virgin, which once, says the story, ordered the Empress Pulcheria out of this Church, when she built it and came in to say her prayers. "You may be a Queen outside, but here there is another Queen. Leave the Church!" So the poor Empress had to go, and by the way of being on the safe side, it was ruled that no female was ever to set foot on the island thereafter! As the tale represents Our Lady as somewhat lacking in courtesy, it may be well to add that point of fact the Monastery was founded in 862 by "pious men of Adrianople," and that there were actually nunneries in the neighbourhood to a much later date! 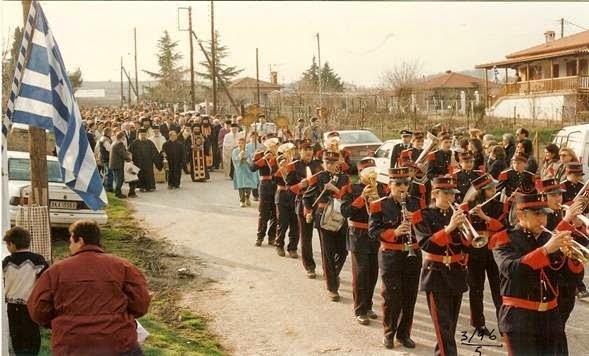 More characteristic of the season was the ceremony of the "Periphora" on the night of Good Friday - a rite usual in all the Balkan lands, if not all the Orthodox Church, but here carried out with unusual pomp and elaboration. In the centre of the "Naos" (the architectural nave, but ritual choir, of the church) there stood a magnificent bier, and on it lay, on cloth of gold, the embroidered figure of the dead Christ, the "Epitaphion." The hundred monks of the monastery (black figures and cowled heads) stood round it in their olive-wood stalls, while the Narthex without was packed with a crowd of pilgrims. There was no light in the great church, save from the wax torches carried by every worshipper, and marvellous was the effect of the half-seen masses of marble pillar and mosaic wall, gold eikonostasis and pavement of "Opus Alexandrinum." Much of the first part of the service that lasted well over three hours (11pm to 2am) was dreary to a Western, consisting as it did of droned litanies, in which, as was remarked, "they do not chant the words, they chant the letters. "But what bored us, to be honest, struck a very different chord in the mind of our Greek companion, who wept unaffectedly all the service through. If the rites of the Orthodox Church have that effect on an educated mind of the type for which they are intended, who can say that they are out of touch with them? It may not be our way, but it takes all sorts to make a Catholic church, if only uniformity-fanatics could believe it. At last the litanies ended, and every member of the congregation, filing two and two before the bier, made solemn obeisance to it. Then came the "Periphora" itself, in which six priests, black vested, took the Epitaphion on their shoulders and bore it out of the Church. The congregation, forming in rough procession, and all bearing their torches, followed, chanting funeral anthems: and so we proceeded, with halts at various stations, all round the great court the monastery and back into the church once more. 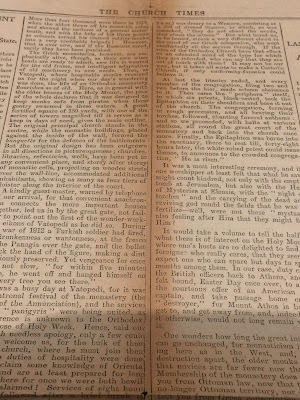 Finally, the Epitaphion was borne into the sanctuary, there to rest till, forty-eight hours later, the white robed priest could issue thence, to announce to the crowded congregation, "He is Risen." It was a most interesting ceremon, and if one worshipper at least felt that what he saw might count kindred, not only with the empty tomb at Jerusalem, but also with the hall of mysteries at Eleusis, with the "night of torches" and the carrying of the dead and reviving God round the fields that he was to fertilise-well, were not these "Mystae" also feeling after Him that they might find Him? It would take a volume to tell the half of what there is of interest on the Holy Mount, where one's hosts are delighted to find the foreigner who really cares, that they seem to expect one who can spare but days to spend months among them. In our case, duty called the British officers back to Athens, and we felt bound, Easter Day once over, to accept the courteous offer of an American naval captain, and take the passage home on his "destroyer," for Mount Athos is hard to get to, and get away from, and, indeed, were it otherwise, would not long remain what it is. One wonders how long the great institution can go unchanged, for monasticism is changing here as in the West, and Russian destruction apart, the older monks complain that novices are fewer now than of old. 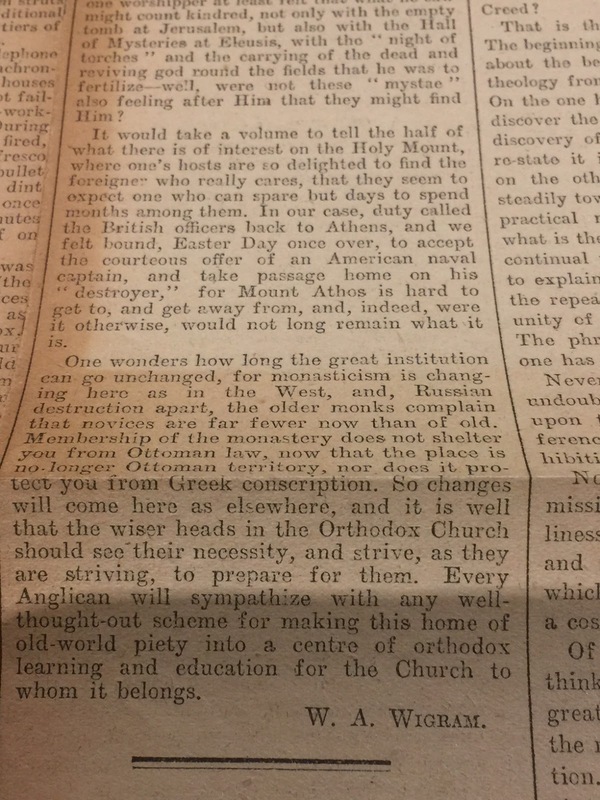 Membership of the monastery does not shelter you from Ottoman law, now that the place is no-longer Ottoman territory, nor does it protect you from Greek conscription. So changes will come here as elsewhere, and it is well that the wiser heads in the Orthodox Church should see their necessity, and strive, as they are striving, to prepare for them. 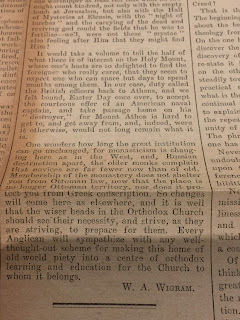 Every Anglican will sympathize with an well-thought-out scheme for making this home of the old-world piety into a centre of Orthodox learning and education for the Church to whom it belongs. 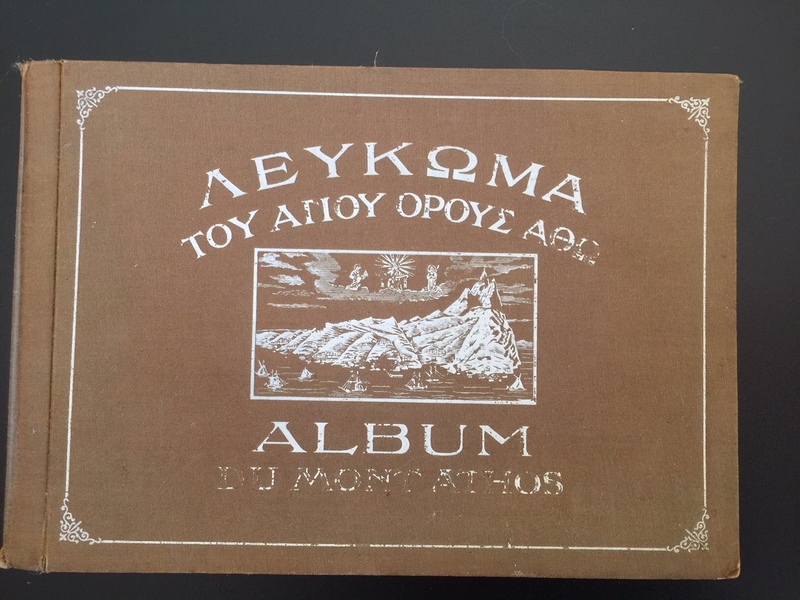 0069 - A rare book on Mount Athos (Part 2). Upon closer inspection of the telegraph, I discovered that it contains details of Mount Athos as seen by the author of the telegram whilst on a pilgrimage. Perhaps they were notes taken in order to be used for the newspaper article we are about to explore. 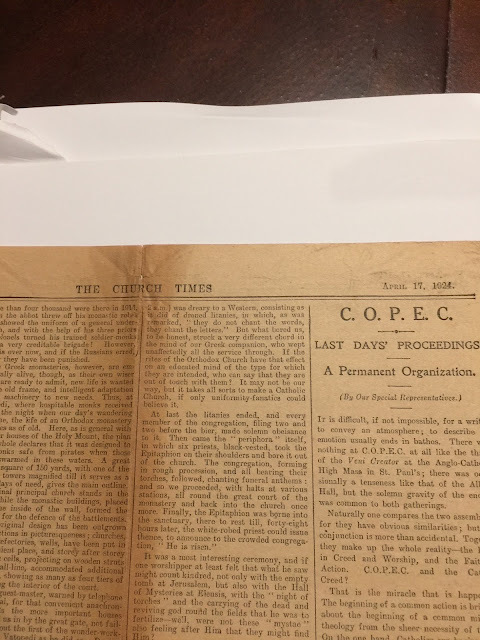 As mentioned in the earlier post, the newspaper article is dated April 17th 1924 over 90 years ago. 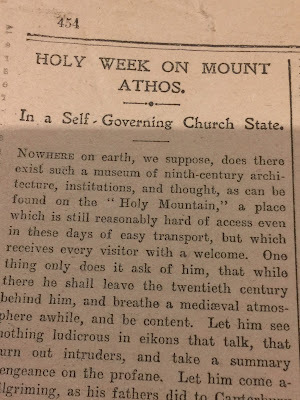 The Article is titled Holy Week on Mount Athos - In a self governing Church State. Instead of photographing the entire article, I will re-write it to make it easier for you to read. I will do this over the course of the next few posts. Nowhere on earth, we suppose, does there exist such a museum of ninth-century architecture, institutions, and thought as can be found on the "Holy Mountain," a place which is reasonably hard of access even in these days of easy transport, but which receives every visitor with a welcome. One thing only does it ask of him, that while there he shall leave the twentieth century behind him, and breathe a medieval atmosphere awhile, and be content. Let him see nothing ludicrous in ikons that talk, that turn out intruders, and take a summary vengeance on the profane. Let him come a-pilgriming, as his fathers did to Canterbury and Our Lady of Walsinghame, and all that the mountain has of ancient charms his to command. 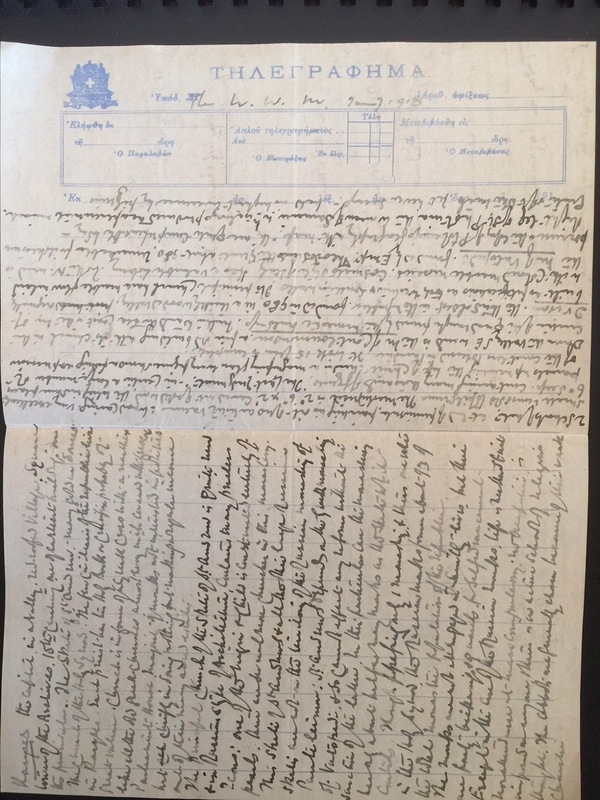 At least it was in this spirit that a party of six, British officers for the most part, but including one Padre and one Greek in the number, made their way on a tiny Greek steamer from Salonikato the harbour of the mountain, in the Orthodox Holy Week of 1923. Athos, it may be well to say at once-for even the old residents in Greece are not always clear upon the subject - is not one monastery, but a little self-governingChurch State; ruled, now that it is part of Greece, by the same constitution as in the days before the Turk came; though be it recorded to the Turk's credit that he never departed from his old promise to respect its freedom. 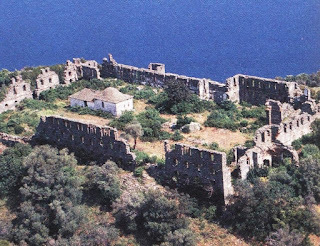 A hill peninsula some twenty miles long, the long ridge of which rises at its southern end to a peak 6,000 fee, it shows as nothing else can what Greece was like in the days before she was so recklessly deforested. All its length is clothed with forests of oak, poplar and plane, with undergrowth of bay and ilex, and the giant white heather that here grows to a height of ten feet. Steams flow through every coombe to the sea, and dotted along its length, on sea-marge, in glen, on towering crag, are the monasteries succursales and hermitages that have stood here since the peninsula was a refuge from ninth-century Iconoclastic zeal, and which legend loves to refer back to Theodosius and Pulcheria. As soon as may be after landing-and that is probably after a night spent at the nearest Monastery - the visitor must repair to the capital of the island there to report himself to the governing body, present his credentials, and exchange them for a passport that will enable him to wander at will among the monasteries, and claim hospitality and transport from each at need. The body in question, the "Koinotes" consists of representatives of each one of the twenty old "houses" of the "island", but it acts through a committee of five, four of the members of which hold the the four quarters of the community seal, while the chairman keeps the frame into which they fit when needed for use. A passport is readily given, and that secured, you may leave the little town, unique in the fact that it alone of all the towns has no woman in its boundary, and wander on at your will, from shrine to shrine. You pass over hills like those of Devon, though on a larger scale, and dotted like them with little white farm-like buildings, which are the "Kellia" where five or six monks live together, and serve tiny chapels bowered in immemorial cypresses. At times one encounters far larger monasteries, modern Russian erections that are theoretically "succursales" (sketai) of some one of the older houses, but which have actually been enlarged till they surpass the parent institution. Such an one is the Skete of St. Andrew (the Serai), close by Caryae itself, where a church of cathedral dimensions is merely the centre of a group of buildings that could house a university roomily, and now which is all but empty. Over a thousand monks, and more than that number dependants, were there when the building was completed in 1902. Some twenty poor peasants are now all that remain in its vast halls, working on the lands of the old hermitages as in the days before the Russians came. A melancholy picture of what we may imagine Fountains or Tintern to have been like, when Henry's work was just done. So ends at leastaor the time, what has been, we fear, an effort to mix religion and politics. It cannot be denied that the Russians, in their efforts to increase their footing in this Mecca of Orthodox piety, and also to get a hold on so important strategic point as this peninsula, were not always too scrupulous in their methods. 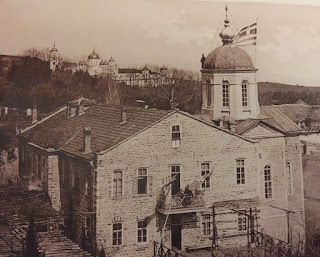 By their own promise, they were never to put more than fifty monks in the House of St. Panteleimon, that was ceded to them in the eighteenth century. 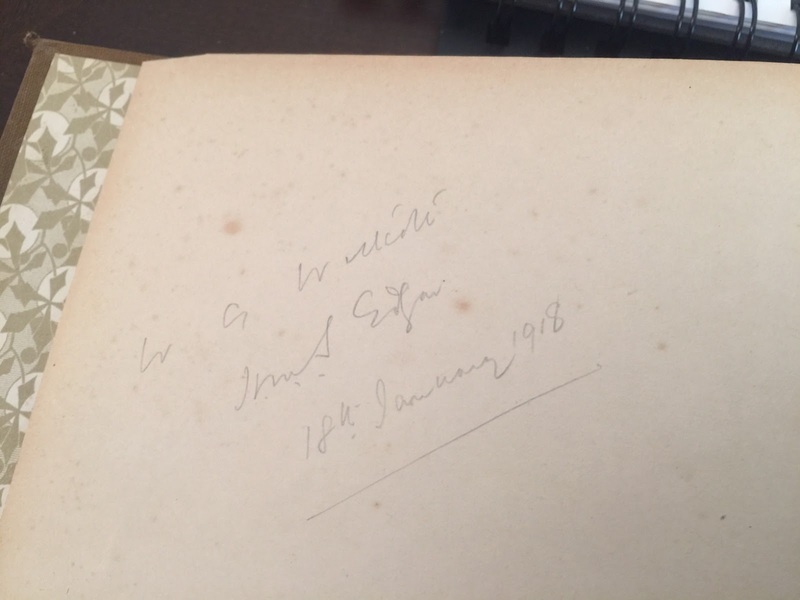 Upon searching the internet for various material and books related to Mount Athos, I came across this particular book which was for sale in a book shop specialising in old and rare books, in the United Kingdom. Of course, my curiosity got the better of me and I had to have it. I therefore purchased the book and will now share its contents with you over the next few posts. It looked quite intriguing and was perhaps the first album of pictures published concerning Mount Athos. 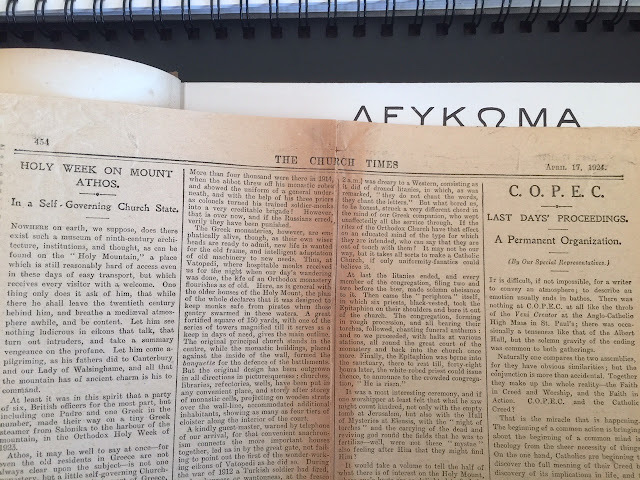 It was first published in 1912, written and published by the Priestmonk Stephanos of the Holy Cell of the Apostle Thomas in Karies Mount Athos. Perhaps I could do some research on this cell and dedicate to it a post in future. The book itself is in excellent condition, having of course the usual discolourations that a book of this age would have. I opened the next leaf and much to my surprise I found two documents inside. 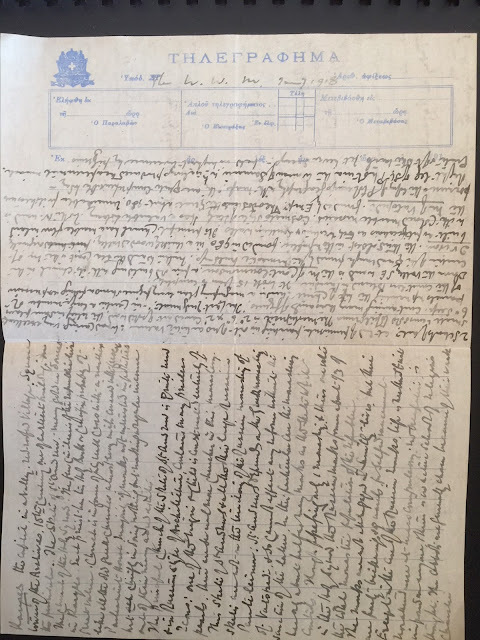 A telegram dated 1918 written in English with a very distinct cursive style which I cannot fully make out. From what I can decipher from the writing, it seems to be a description about a visit to the Holy Mountain. Underneath the Telegraph I found another document. 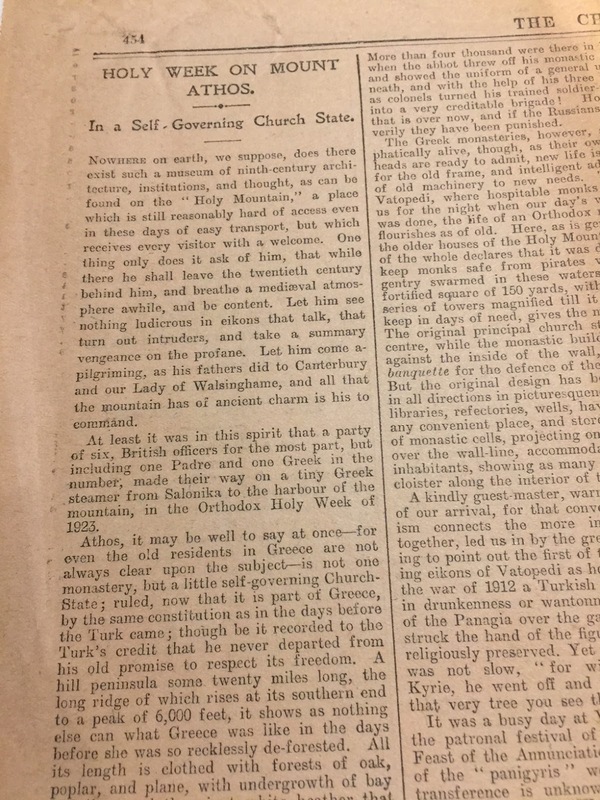 This time it was a page from a newspaper called THE CHURCH TIMES and is dated April 17th 1924. 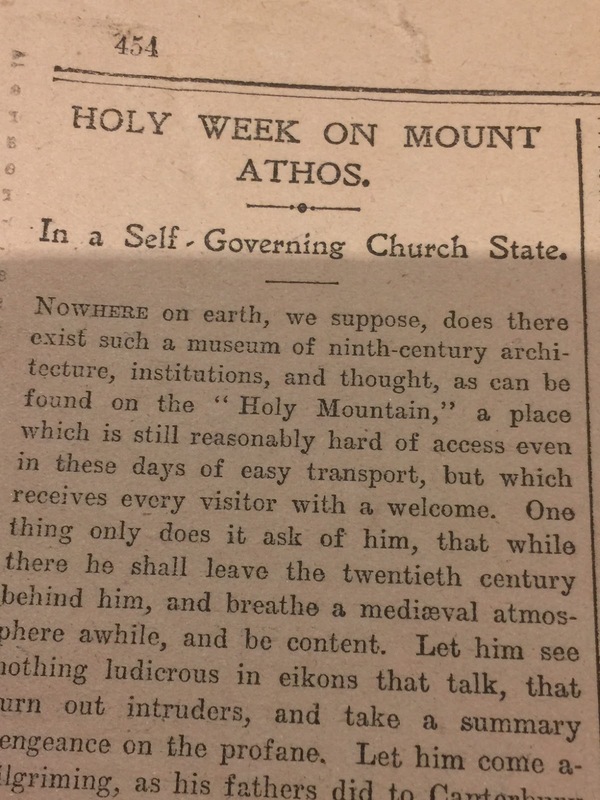 Upon closer inspection I found an article titled HOLY WEEK ON MOUNTH ATHOS - In a Self - Governing Church State. The article is written by W. A. Wigram see wikipedia link for his biography. 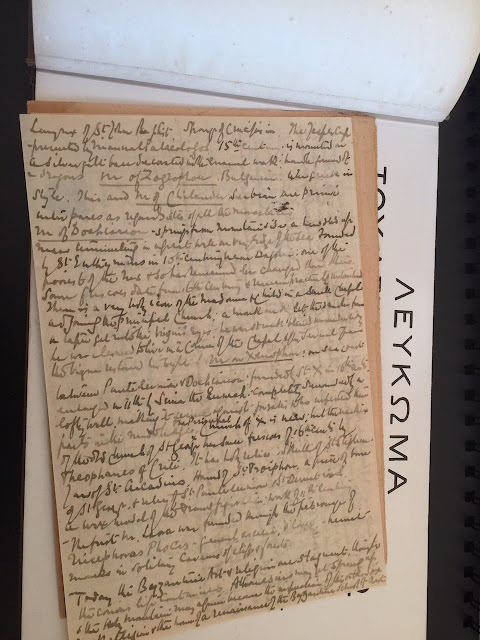 I couldn't believe my eyes, this was an unbelievable stroke of luck, having found within a historical reference book, further historical references relating to the most solemn and beautiful time on Mount Athos, that being Holy Week. On the next post, we will explore the article written by W.A. 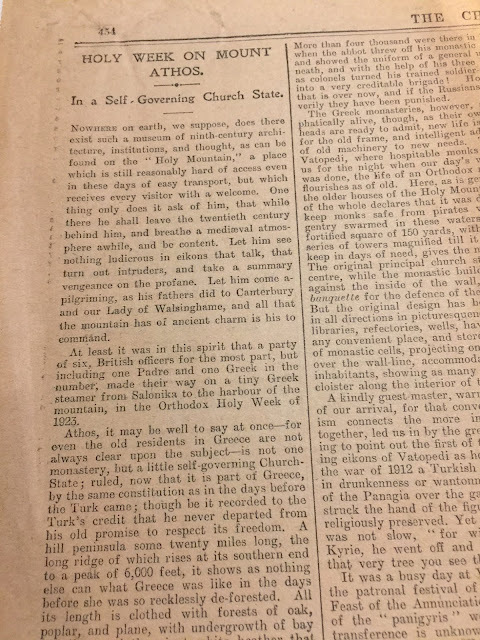 Wigram in the newspaper leaf. 0067 - Return to posting on this blog. Dear Readers and followers of this blog. Some time has passed since regular posting has taken place on this blog. I will re-commence periodical posts on the blog especially leading up to an imminent trip back to the Holy Mountain. I trust that you will enjoy some of the content. In the Catholicon (Main Church) of the Holy Monastery of Xeropotamou, 13 pieces of the True Cross of Jesus Christ are treasured, 4 large pieces in ancient reliquaries and 9 smaller pieces which are also housed in reliquaries with other Relics of Saints. 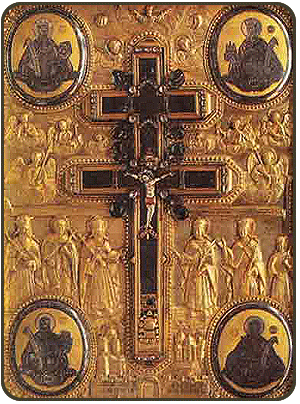 It is quite likely that all of these pieces of The True Cross were originally one large and unique piece, most likely of the piece that was donated to the Monastery by the Eastern Roman Emperor (Byzantine) Romanos 1st Lekapinos. The First and largest of these pieces is considered to be the largest piece of the True Cross of Christ in the world, and at the lower section of it, one of the holes that was created by the nails that pierced Christ’s Holy Body can be seen. It has the shape of a Cross and is encased in a pure gold inner casing which has been designed in order to display the entire piece of the True Cross. It has a length of 31cm and at its widest part it is 16cm wide. The entire piece weighs 320 grams. This piece of the True Cross never leaves the Monastery and is only displayed on Feast days of the Monastery and during the Feast days of The Holy Cross. 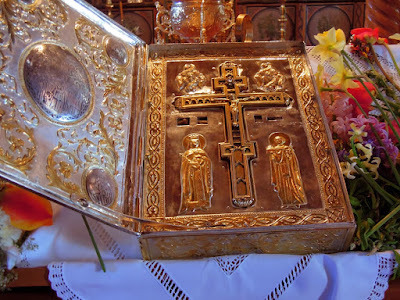 The second largest piece of the True Cross of Christ which is kept at the Holy Monastery, also has the shape of a Cross and is encased almost entirely in gold except for a small section which is left open to be venerated by the faithful. This is the piece that is taken out of Mount Athos, when requested by various Metropolises and cities outside of Mount Athos. We are all aware of the myriads of miracles that are attributed to the True Cross of Our Lord, however, this piece of the True Cross has a miraculous characteristic, it exudes a faint fragrance which is not anything like a natural or made perfume. This is witnessed by the majority of the faithful that have the opportunity to venerate It. 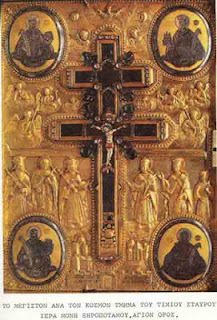 The reliquary in which the second piece is housed also has small piece of the Holy relics of the 40 Martyrs and the relic of St. Modest Archbishop of Jerusalem the Martyr who is considered the protector of animal farmers. Every year on Palm Sunday, thousands of people gather in the village of Petrokerasa in Greece to welcome the Holy Cross of The Monastery of Xeropotamou. The welcoming ceremony is a momentous event organised with Ecclesiastical grandeur and spirituality. The journey, welcoming ceremony and hosting of the True Cross of the Holy Monastery of Xeropotamou occurs every year without fail to this village from the year 1768 and probably even longer every Palm Sunday. This ancient tradition, in which the Fathers of The Holy Monastery keep true to, is done in the same manner and tradition which has been handed down and historically documented since 1768. This is due to a great miracle that occurred in the 18th century in this village. The village was plagued by a deadly disease which was affecting all of the inhabitants. The Holy Monastery of Xeropotamou was contacted by the villagers in order to bring the True Cross to the Village in order to bless it. The Fathers, immediately after receiving word, and with great honours and a Grand procession, brought the piece of The True Cross to the village and upon Its procession around the village, the village was saved and the disease that plagued its inhabitants was eradicated in miraculous circumstances due to the presence of the True Cross. In memory of this great miracle, the True Cross of the Holy Monastery of Xeropotamou Mount Athos is taken to the same village every year to be venerated by the villagers and faithful. 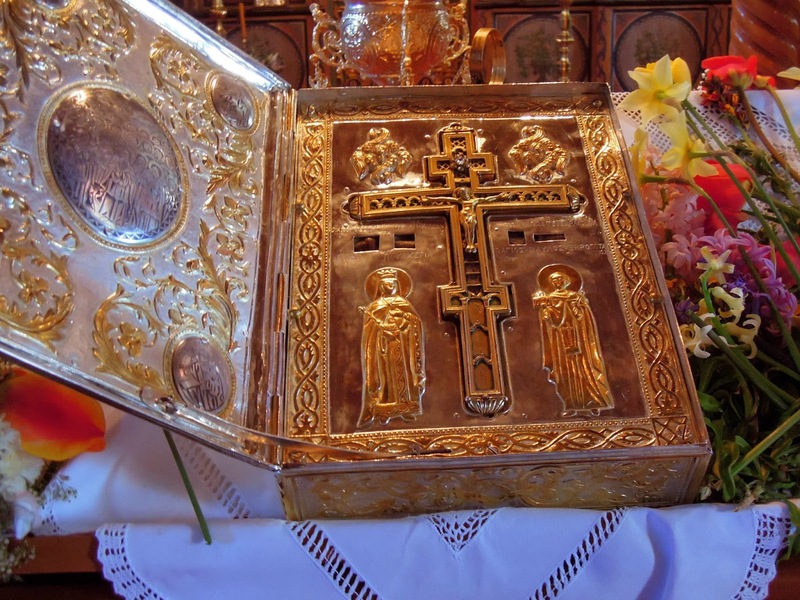 0038 - Holy Relics kept at Athonite Monasteries. 0057 – The Miraculous Icon of Panagia Pantanassa – Holy Monastery of Vatopedi. 0048 - A real incident that occurred in a Cell of Kapsala, Mount Athos. 0028 - The Pilgrimage to Mount Athos of Professor James S. Cutsinger Part 9 & Final. Hi all, my name is Fr George and I am a former student of Athonias Ecclesistical Academy, Karies Mount Athos. I welcome you to my Blog and hope that you enjoy my articles.